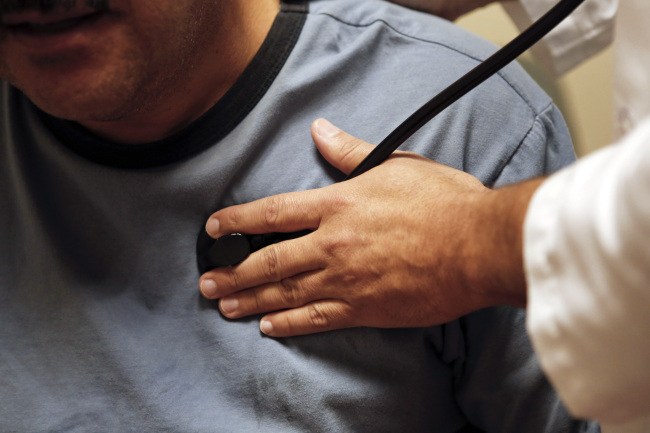 A doctor checks a patient during an examination at the St. John’s Well Child and Family Center in Los Angeles. NEW YORK (AP) ― In the midst of the diabetes epidemic, a glimmer of good news: Heart attacks, strokes and other complications from the disease are plummeting. The Centers for Disease Control and Prevention research is reported in Thursday’s New England Journal of Medicine. Diabetes is a disease in which sugar builds up in the blood. The most common form is tied to obesity, and the number of diabetics has ballooned with the rise in obesity. Today, roughly 1 in 10 U.S. adults has the disease, and it is the nation’s seventh leading cause of death, according to the CDC. The obese are already at higher risk for heart attacks and strokes. But diabetics seem to have more narrowing of their blood vessels ― a condition that can further foster those problems. The stroke rate fell less dramatically ― but still declined by more than half, finishing at 53 per 10,000. The heart attack and stroke rates for diabetics are essentially even now, lead author Edward Gregg noted. The researchers saw declines in hearts attack and stroke rates for non-diabetics as well, but those improvements weren’t nearly as big as they were for diabetics. The growth in the number of diabetics “wiped out most of the gains” from the declining rates, so the number who ended up in the hospital for strokes or amputations swelled, said Dr. Robert Gabbay, of Boston’s Joslin Diabetes Center. The study also found that the rate of kidney failure dropped by 28 percent. But that wasn’t true for all ages ― the rate in those 65 and older actually increased, for reasons that aren’t clear. That could be a sign diabetics are living longer ― long enough to get kidney disease, Gregg speculated.